Dani Alves Moving to PSG? 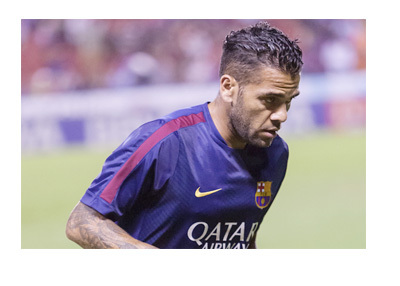 Update: Dani Alves signed a 2 year contract extension with Barcelona FC on June 9th, 2015 following a treble winning season with the club. After myriad rumors of Barcelona right-back Dani Alves moving to Liverpool or Manchester United floating around, the issue seems to have been settled. According to the Spanish publication Marca, Alves will be leaving Nou Camp for Paris St.Germain once his seven year contract with Barcelona FC expires in June this year. The Catalan club have not expressed a willingness to retain the 31-year old veteran defender beyond that time despite facing a ban on recruiting players from outside. So after Barcelona's La Liga fixture against Rayo Vallecano on Sunday last, Alves paid a visit to Paris to finalize details of the ensuing deal with the Parisian club. The full-back was with Barca since 2008 in a phase when the club won almost every single title one could imagine, featuring in as many as 208 games for them. He has appeared in 30 matches for the club in this season alone including the impressive 2-1 away win over Manchester City at the Etihad stadium in a UEFA Champions clash. He donned the international cap for his country, Brazil, on 79 occasions. Before joining Barcelona, he served La Liga rivals Sevilla from 2002 to 2006 featuring in 178 games. Alves had to bear the cruel brunt of racism in 2013 and subjected to taunts in Spain, a real shame for someone who put in decades-long dedication and passion into the sport in the Iberian nation. In April 2014 a banana was thrown at him at the Villareal stadium. Alves's reaction to that was picking up the banana and eating it. The sporting character that he is, he said that these things don't change easily and have to be taken with a dose of humour. Such incidents may also have influenced the Brazilian-born defender's decision to move out of the country once and for all and the PSG deal seemed to be the perfect answer. Dinorah Santana, Alves's agent has confirmed that talks with the French club are at an advanced stage. At PSG, he will be joining a phalanx of Brazilian defenders like David Luiz, Thiago Silva, Maxwell and Marquinhos, but hoping to give his present club, Barcelona, a fitting finish to the season. Barca are now leading the La Liga standings and are one of the favourites to lift the Champions League trophy too, given the kind of spectacular form they are in. Alves will be reportedly paid a remuneration of 9 million Euros per season for his three-year deal with PSG.